18 MMS December 2016 mmsonline.com MARK: MY WORD Commentary Recalibrating This annual period of endings and beginnings is a good time to adjust one's outlook and expectations. I plan to do this with three words. This is the strangest time of year. At the work- place, the year's ending may spur a flurr y of activity: orders to get out, jobs to ship, inventory to clear, paperwork and applications to file. Or there may be a lull because new business ven- tures and projects have been postponed until after the new year arrives. At home, it's often a s i m i l a r m i x: th e f ra nti c p re p a rati o n s fo r th e holidays, rushing to visit relatives out of town or struggling with family issues. But there are also happenings when tradition, customs, ancient bonds and deep connections suspend time, if only in a momentary pause. When I find myself caught up in this seasonal flux, I know it is time to recalibrate my life. It's a time for me to balance action with reflection, turn reflection into resolution and fulfill resolution by action. This is not a return loop, but a cyclical transition from the hectic to the healing. Here's how I intend to do this: At home, I am choosing three simple words to put on a card that will sit on my nightstand or be taped to the bathroom mir ror. L ikewise, at wor k, I am choosing thre e simple words to tack on my wall or post on my PC screen. I may even have three words for posting on the dashboard of my car. 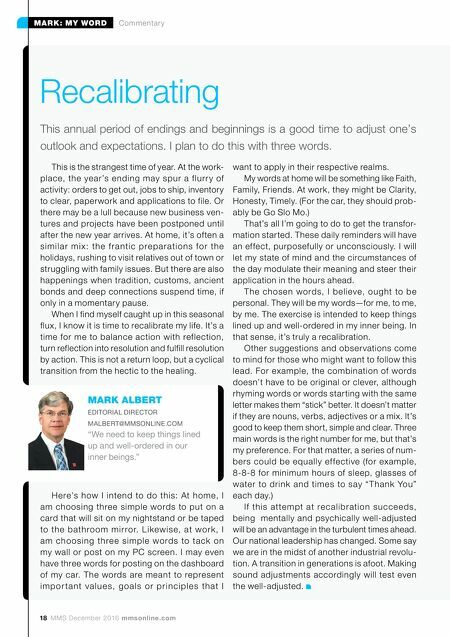 The words are meant to represent i m p o r t a nt va l u e s, g o a l s o r p r i n c i p l e s th at I MARK ALBERT EDITORIAL DIRECTOR MALBERT@MMSONLINE.COM "We need to keep things lined up and well-ordered in our inner beings." want to apply in their respective realms. My words at home will be something like Faith, Family, Friends. At work, they might be Clarity, Honesty, Timely. (For the car, they should prob- ably be Go Slo Mo.) That's all I'm going to do to get the transfor- mation started. These daily reminders will have an effect, purposefully or unconsciously. I will let my state of mind and the circumstances of the day modulate their meaning and steer their application in the hours ahead. T he chosen words, I believe, ought to be personal. They will be my words—for me, to me, by me. The exercise is intended to keep things lined up and well-ordered in my inner being. In that sense, it's truly a recalibration. Other suggestions and obser vations come to mind for those who might want to follow this lead. For example, the combination of words doesn't have to be original or clever, although rhyming words or words starting with the same letter makes them "stick" better. It doesn't matter if they are nouns, verbs, adjectives or a mix. It's good to keep them short, simple and clear. Three main words is the right number for me, but that's my preference. For that matter, a series of num- bers could be equally ef fective (for example, 8-8-8 for minimum hours of sleep, glasses of water to drink and times to say "Thank You" each day.) If this at te mpt at re c alibration succe e ds, being mentally and psychically well-adjusted will be an advantage in the turbulent times ahead. Our national leadership has changed. Some say we are in the midst of another industrial revolu- tion. A transition in generations is afoot. Making sound adjustments accordingly will test even the well-adjusted.